In the last 20 years the search for Earth-like planets around other stars has accelerated, with the launch of missions like the Kepler space telescope. Using these and observatories on the ground, astronomers have found numerous worlds that at first sight have similarities with the Earth. A few of these are even in the 'habitable zone' where the temperature is just right for water to be in liquid form and so are prime targets in the search for life elsewhere in the universe. Now a team of scientists have looked at how these worlds form and suggest that many of them may be a lot less clement than was though. They find that planets that form from less massive cores can become benign habitats for life, whereas the larger objects instead end up as 'mini-Neptunes' with thick atmospheres and probably stay sterile. The researchers, led by Dr. Helmut Lammer of the Space Research Institute (IWF) of the Austrian Academy of Sciences, publish their results in Monthly Notices of the Royal Astronomical Society. Dr. Lammer and his team modelled the balance of capture and removal of hydrogen for planetary cores between 0.1 and 5 times the mass of the Earth, located in the habitable zone of a Sun-like star. In their model, they found that protoplanets with the same density of the Earth, but less than 0.5 times its mass will not capture much gas from the disk. Depending on the disk and assuming that the young star is much brighter in ultraviolet light than the Sun is today, planetary cores with a similar mass to the Earth can capture but also lose their enveloping hydrogen. But the highest mass cores, similar to the 'super Earths' found around many stars, hold on to almost all of their hydrogen. These planets end up as 'mini Neptunes' with far thicker atmospheres than our home planet. 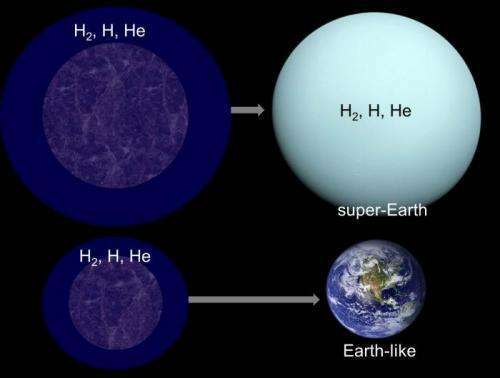 Dr. Lammer comments "Our results suggest that worlds like these two super-Earths may have captured the equivalent of between 100 and 1000 times the hydrogen in the Earth's oceans, but may only lose a few percent of it over their lifetime. With such thick atmospheres, the pressure on the surfaces will be huge, making it almost impossible for life to exist." The study was carried out by researchers within the Austrian FWF Research Network "Pathways to Habitability". We'll never know for sure unless/until we can visit one or more of these worlds - too bad that is unlikely in the foreseeable future. Perhaps a probe that enters the afmosphere of Jupiter, Saturn, Uranus or Neptune and doesn't descend, but floats at a level where water vapor is abundant - might it find extremophile life there? I suspect that the current trend of "the more variables we know the less likely we'll find habitable worlds" will continue. In fact I'm almost sure of it. The universe, taken as a whole, is virtually completely inimical to life as we know it. If you add another variable, you're basically adding another reason life can't exist in a specific environment rather than a variable that makes conditions more conducive for life. We'll know in fairly short order however with instruments that can "sample" spectroscopically atmospheres of exoplanets where the question of life stands in the universe. Even as they write up this study 'they' insist on calling these exoplanets super-earths instead of what they are or even using the term mini-Neptune which itself is possible called a mini-Jupiter. So let us stick to descriptive terms and not use stupid terms. I would not be surprised if they start calling these planets as being X times the size of a football field that term crops up entirely too much for my taste. Then I have to go out and measure a football field to see what they are talking about. some of them are known to be rocky, but I agree, distinguishing between gas or a rock planet is more useful than "Earth" or "Neptune" like. But I think you (above) know that the referral has mostly to do with it's size. Apart from that I don't see the problem with the atmosphere. 2x the atmosphere would mean 2 bar, right? (correct me if I'm wrong). the pressure should be survivable for humans, so why not for a species that has adapted to it? I don't know why people have this dream of finding habitable worlds. Look at the very narrow ranges in temperature, radiation, gravity, atmospheric pressure, atmospheric composition (which doesn't even come into being without a preexsiting biosphere! ), etc. humans can survive under. No mattre how close a world will be to a number of the above factors: If just one of these is out of our miniscule range of surviveability it means donning full suits and living in fully enclosed biospheres. Might as well live in a space station from a technical point of view. No point at all even trying to live on another planet. If anything it'd be MORE difficult than trying to make a liveable habitat in space. We are still in the blind stone age period, in searching for planets. We have to get much larger instruments to map millions/billions of planets. Then gather information on planets with liquid water and preferably oxygene and temperatures close to what we have on Tellus. This will at least give us a chance to pinpoint where to search for life, and eventually send probes. Until then we can excavate the local pond (own solar system). This is an interesting study. What's more interesting is what type of chemistry might arise that could lead to life and how that could evolve in a high pressure environment. Liquid H20, abundant hydrogen, high pressure, I don't see why anyone would state vehemently that this ia an environment almost impossible for life to exist without using the qualifier, as we know it. Who cares if its only some sludge, life is life? I see your points but should humans ever get to the point of trying to inhabit another world, a lot will depend on how we evolve, really. problems with astronauts in long term micro-gravity are abundant, and take time to rehabilitate from, so even living in suits (and a self contained biosphere) on a planet with similar gravity would be better (as we are now) than living long term in micro-gravity or NO gravity. Better edit this one. You don't have to worry about ^2H (deuterium, 1 neutron and 1 proton). You also don't have to worry about the H atom. H2 (molecular hydrogen) and He are legitimate concerns for a heavy rocky core. Notably this is in tension with observations, which suggests planets less than 1.5 Earth _radii_ are denser, i.e. not mini-neptunes. Meaning planets at 0.5 - 3 Earth masses are potentially habitable, or twice the range suggested here. The problem can be that gas addition and stripping processes are many and, I think, hard to estimate. And/or reversely that the observations are difficult. @LariAnn: Few of the involved scientists seem to think that we won't know about the atmospheres for sure until we have local, in-system instruments taking observations. The reason is that successfully characterizing atmospheres seems possible from here starting with current technology and on, and early results shore that up. Oh, there are problems (clouds foremost). But no show-stopper as of yet. @ModernMystic: Rare Earth open-ended bayesian models have been attempted before, and they end up ridiculed because they are untestable by construction. You can decide your wanted outcome, either close to 0 or 1, and keep adding factors until you achieve your target. The lower limit for habitability is set by the frequency of Earth analogs, which are IIRC estimated to ~ 6 billions in the Milky Way. That means ~ 6 % of stars will have a habitable with a high likelihood for life. In other words, your somewhat confused description here looks to many readers like you should "cut the crap", as you describe it. If you are confused by the terminology, just say so. We can all sympathize with that. @Sinister: Don't presume to constrain other's behavior, it is rude. I aim to call those who troll trolls, and those who espouse creationism for creationists. The idiocy of Rare Earth ideas, which is untestable theories at heart - even if each proposed factor can be tested in isolation, the whole mess is unconstrained - is one of my pet peeves. But like those other cases, I call it where it applies. Note that creationists have adopted Rare Earth ideas as an "argument" against astrobiology, if not yet being the exclusive users. @vlaaing_peerd: Well, for one the pressures would be hundred of bars (cf Venus). Those are survivable for prokaryotes (see Rob's comment), but organisms with different density of tissues may have a problem. For another problem, such planets would likely have vast oceans and no continents. A massive planet somewhat compensates for more water as it goes into the crust, so superearths are believed to be like Earth. But there is a limit for that compensation. At the timeframes it takes to get...well..anywhere we'll long be either fully synthetic (or fully virtual). At that point environment beyond the most extreme doesn't matter at all. Think about WHY we live on a planet. It is because we (and every organism that contributed to our ancestry) have adapted to it over billions of years and it supplies what we need. Once we shape ourselves into any form we feel like there remains nothing a planet does for us. Cybernetics is already on the way. So is bio/genetic engineering. AI isn't going to be thousands of years off (and that's the least time we'd need to get even to the closest star). I see your point. I got locked into the strictly biological part, whereas there is no real reason to assume that we will continue to live as we are now, nor is there reason to assume that we could not enhance/evolve relationships with mechanical assistance/AI. Hypocrite, you knew it from the beginning, you just needed the money and excuse; beggar. I'm unimpressed that best we can do is to find the biggest shadows; what a joke. Nasa robotics, another joke. I understand that we want to do the colonization ourselves and that they are making every observation possible to fascinate that, but for starters MARS has since a thin atmosphere that really all observation should be made from a satellite view point. Only if Mars had a thick atmosphere does it make sense to assign that task to robots. Now you might say well fok its for a closer look; "Didn't you see enemy of the state, if they can do it on earth, they can do it on mars". Now if these robots did useful whatsoever other than broadcast information back I would not have so much disdain, but they don't. Even Nasa's intelligence gathering robots are poorly deployed and conceived. For example, if you want to find water on mars then you design a cheap sturdy auger, make 40 of them, each one has a signal anchor and they drill down on site, you deploy them from 1 launch spread over the planet with water sensors. It's an easy step to take, as our biology has served us well in the past. But it pays to remember that biology is always a product of an environment. Our biology can only handle gradual changes. Change the environment radically (as landing on a new planet must) and the biological system will fail. You are aware that your scheme would require power and robotics in the megawatt and multi-tonne range. Check the figures for what kind of payloads we can send to Mars (and at what cost) and then rethink your comment. I have no clue what you're talking about here. We take the variables we know, just like you did below, and plug them into a formula to get a percentage. It's pretty straightforward and sound. If you know of a different or better way to make an educated guess I'm all ears. The lower limit for habitability is set by the frequency of Earth analogs, which are IIRC estimated to ~ 6 billions in the Milky Way. Based on what evidence or vairables or observations? Show me the math and the methodology. That means ~ 6 % of stars will have a habitable with a high likelihood for life. I say it's a lot higher than that (for simple life) let's compare notes, data, and math. And if I recall, you called me a "creationist troll" because of that. My argument had nothing to do with a "God", or any religion. Indeed, I've noticed this happens a LOT on these threads. As an atheist I've been called a creationist bible thumping idiot for suggesting that intelligent life and complex life is a rare event in the universe. There are a lot of rarities in the universe...like stars of over 200 solar masses. I don't get called a creationist idiot for pointing that out. I think it's because the mass of stars has little to do with most people's identity and worldview and the question of life does, whether or not you define your beliefs for or against the issue. For me, I HOPE that we're not alone. However, I seriously doubt we'll be finding "anyone" else out there very soon...if ever. There are a lot of rarities in the universe...like stars of over 200 solar masses. I don't get called a creationist idiot for pointing that out. But you have to admit that the one (about the big stars) is an observable fact while the other is pure conjecture. You can't say something is rare based on one data point (neither can you say something is common based on one data point). With such a lack of data no sensible extrapolation can be made. It is simply unknown. And no amount of playing with numbers (e.g. by making up stuff: AKA the Drake equation) will change that. But you have to admit that the one (about the big stars) is an observable fact while the other is pure conjecture. I wouldn't say pure conjecture. One thing I've never understood is that people say that the universe is isotropic and mediocrity applies to this question of complex life elsewhere. Well if we're basing our conjecture on the fact that things out there are the same as here then where are they? They should have already been here, made contact, or left evidence somewhere. If they're very different than us then the premise is false to begin with and you have to fish for another. So, yes it's conjecture, but not "pure conjecture". With such a lack of data no sensible extrapolation can be made. Then why do people get defensive when you question their extrapolation that complex life is abundant? And no amount of playing with numbers...AKA Drake equation) will change that.